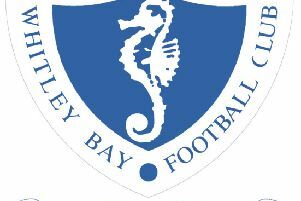 Whitley Bay FC began their pre-season programme with a weekend double-header in south west Scotland. On Saturday, along with an excellent following of fans, they made the 110-mile journey to take on Scottish Lowland League side Dalbeattie Star at their attractive Islecroft Stadium. This was the fourth time that the sides have met, all in pre-season fixtures, and on their only previous visit to Dalbeattie 11 years ago, a David McMahon penalty gave Bay a 1-0 victory. It was an identical scoreline this time, with the goal a stunning shot from the edge of the penalty area coming from triallist Chris Goss. The home side, having already played one pre-season fixture, looked sharper in the first half but Whitley’s back four of Michael Laws, Chris Reid, Chris McDonald and teenage triallist Luke Watson defended impressively, allowing Dalbeattie few chances, and the only time Dan Gladstone was really tested came after 16 minutes when the young Bay keeper saved well from Tommy Muir. Whitley had failed to pose a threat in attack in the opening period, but after the interval they came much more into the game, with substitutes Hylton Laws and Scott Prosser both playing their part. A sustained spell of Bay pressure put the hosts on to the back foot midway through the half, and Star’s substitute keeper Euan Drysdale pulled off a double save to deny young striker Laws and then Nathan Jack. Drysdale again saved from Laws after 70 minutes but he was left helpless four minutes later when Goss fired an unstoppable 20-yard shot into the top corner. Whitley might have extended their lead a few minutes later when Michael Laws headed just past the post following a right wing cross from Jack.